Before WW2 the United States Marine Corps still had enough equipment in stock to equip the small Marine force. Much of this stock was of WW1 Vintage. Special gear was to be procured through the Naval Equipment Board, or was made by the Marine Corps Depot in Philadelphia. Items ordered through the Navy can be recognized by the “NOm #####” marking (NOm stands for Naval Order marines). At the Philadelphia Depot the Marine Corps had a small production facility. Here the Corps produced its own gear needed for a small pre-war Marine Corps. 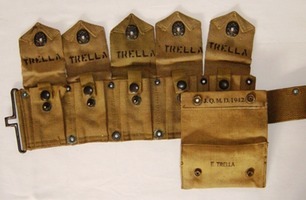 In this facility were the leggings, first aid pouches, canteen covers, experimental packs and the like made. It was run by a marine staff, but the tailors were contracted civilians. 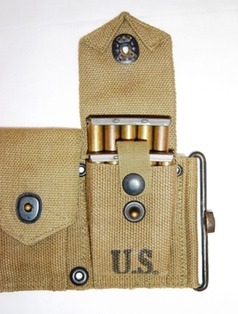 In 1923 the U.S. Army accepted a new design for the cartridge belt that would hold 20 stripper clips for the M1903 rifle. 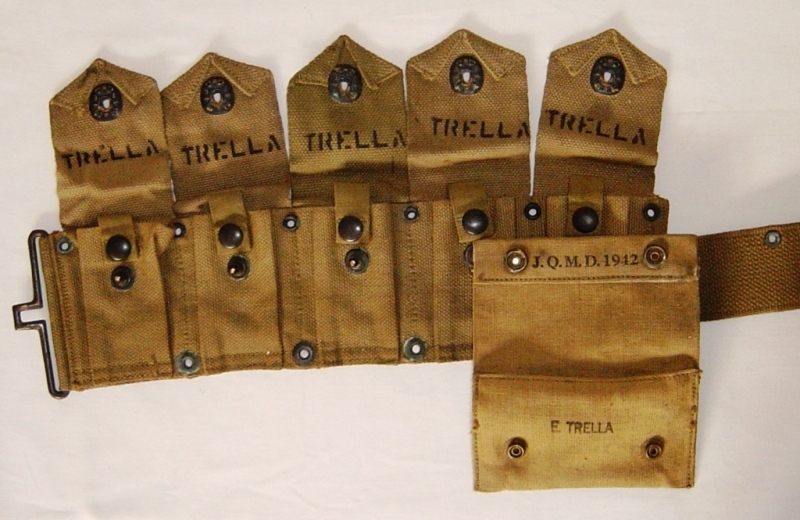 Two of these 5 round-stripper clips would fit in one pocket just like the older WW1 belts, however, there was a retaining strap that holds the second clip in place after the first one was removed. 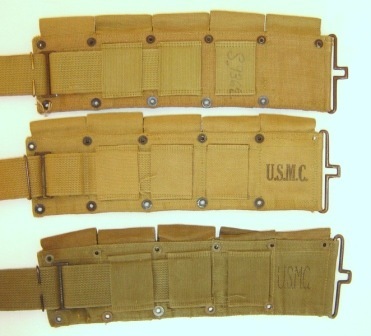 When the Marine Corps needed to replace the WW1 vintage cartridge belts, or to fill the stocks, because the Corps was expanding rapidly. They accepted the new design and ordered them to be made by the Boyt Company. 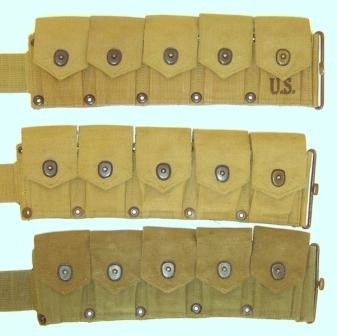 These belts were similar to the army’s in design, but differs in markings. The army version has a bold U.S. Stamped on the front of the extreme right pocket, while the Corps’ is stamped U.S.M.C. on the back of the left part of the belt. For comparison there are three belts shown. The top belt is the Army’s M1923 made by Boyt in 1942. 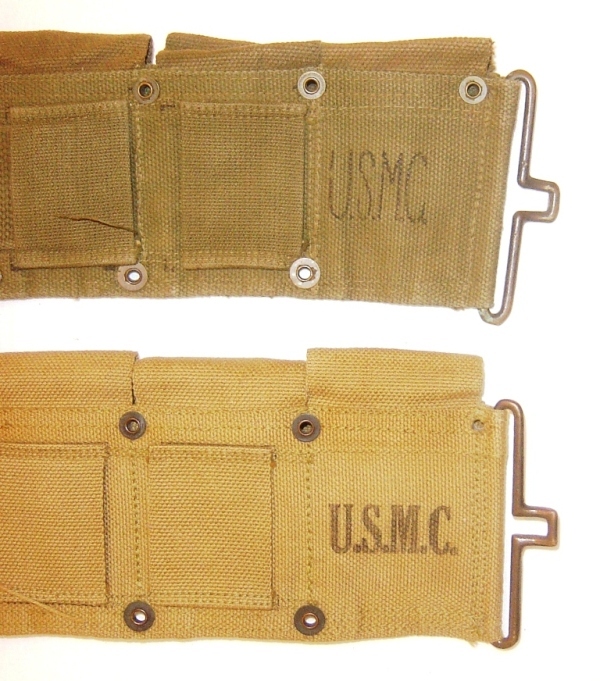 In the middle is shown a Boyt 1941 manufactured belt clearly marked U.S.M.C. in bold letters. Both belts are OD#3. The third belt is a post-war manufactured belt in a mix of OD#7 and the new OG#107 colors. Note that the marking is a U.S.M.C. without the serifs. A close-up of the differences between the war and post-war USMC stamps is shown here. There’s another difference. The coupling strap is held by a wire “ring” next to the buckle. (Indicated by the red arrow.) With the Army belt this ring is open, but the WW2 Marine version is closed. This was with all the U.S.M.C. cartridge belts in WW2! Even if there are no markings left, this type can still be identified as a Marine item. The post-war version has the open ring again. From left to right in both pictures: First: BoyT -41-, U.S.M.C. (the year is fitted between the larger B and T.) This belt was made in 1941, proving that the Marine Corps was already gearing up for war before the Pearl Harbor attack! Next: BoyT -42-, U.S.M.C. (Same marking as above, but with a 1942 date.) This belt is thoroughly marked by its owner E. Trella*. In the picture below is shown not only the property stamp markings, but also the bigger combat identification markings. Each marine was given a name stamp set in bootcamp. All gear issued to the marine was to be stamped with his name. Usually this name stamp is called a laundry mark by collectors, but since everything was to be stamped, including shoes and field packs, this is more correctly a property mark. Once going overseas to the combat theaters, the marines were ordered to mark their equipment and clothing with bold letters. This was usually done with black paint, but can be found in white, yellow, blue or red paint. This extra marking of the equipment served the grim purpose of identification of battle casualties. Last: BOYT -43-, U.S.M.C. The Boyt lettering is of all the same size with the year underneath it. Notice that the middle leg of the M in the U.S.M.C. is shorter than the previous markings. *Mr. Edward Trella survived the war and died of age 82.